Sarsour and Mallory hosted the rally to show their support for Dr. Christine Blasey Ford, one of the women who have accused Supreme Court nominee Brett Kavanaugh of sexual misconduct. Both Sarsour and Mallory shared remarks before turning over the microphone to Warren, who said that she believes Ford's testimony. "I believe Christine Blasey Ford! I am angry on behalf of women who have been told to sit down and shut up one time too many!" Warren said. "I BELIEVE CHRISTINE BLASEY FORD. I am angry on behalf of women who have been told to sit down and shut up one time too many!" "Not even a full week for an FBI investigation. A single copy of the report given to the Senate. 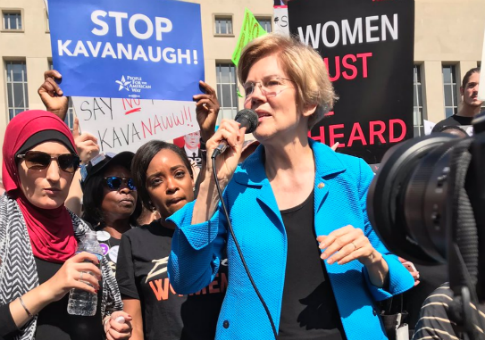 Less than an hour to review," Warren tweeted before the rally. "This is a complete sham. @SenateMajLdr McConnell said he’d plow Brett Kavanaugh through, and that’s exactly what the GOP is doing – no matter the cost." "I want to introduce to you another champion, another one of our people who works for us on the inside. Someone who understands that she works for the people of this country, who's been speaking up against sexual assault and sexual violence before there was a Brett Kavanaugh. Please give it up for the senator," said Sarsour, introducing Gillibrand. Mallory and Sarsour both have a history of criticizing Israel and being closely connected to Nation of Islam leader Louis Farrakhan, a vocal anti-Semite. Mallory received backlash back in March for attending Farrakhan's annual Saviours' Day address, an event where the Nation of Islam leader attacked "that Satanic Jew," called Jews "the mother and father of apartheid," and proclaimed that "when you want something in this world, the Jew holds the door." By attending the event, a regional Planned Parenthood organization serving the Northwest United States and Hawaii announced they they were parting ways with her for their April luncheon, where she was originally scheduled to be the keynote speaker. Mallory previously referred to the Nation of Islam leader as "honorable" and said she was "super ready for this message!" before an event in 2016, according to CNN. Mallory penned an op-ed for News One earlier this year, where she argued she should not be "held responsible for the words of others when my own history shows that I stand in opposition to them." Back in June, Mallory also stirred controversy by saying that the founding of Israel was a "human rights crime"
Like Mallory, Sarsour has a history of being anti-Israel, including a speech in 2015 at a Nation Of Islam event, where she was critical of Israel. She has also discounted anti-Semitism, saying that "while anti-Semitism is something that impacts Jewish Americans, it’s different than anti-black racism or Islamophobia because it’s not systemic." At a June 2018 event hosted by the Center for Constitutional Rights and the Justice Delegation, Sarsour said "Palestine is the global social justice cause of our generation" and that there is an "apartheid happening in Palestine, funded by our taxpayers' money." Mallory also spoke at the event, where she said the state of Israel "takes the lives of people who were there first." At the same event, she pushed back against people calling her anti-Semitic, saying, "When you hear people calling me an anti-Semite, or saying that the CCR [Center for Constitutional Rights] is an anti-Semitic organization, you have to stand up and say no! Because actually it’s a disservice to Jews to call people like us anti-Semites when there are true anti-Semites in the White House!" Sarsour also called for a "jihad," or holy war, against the Trump administration last year, at the annual Islamic Society of North America convention in Suburban Chicago. This entry was posted in Politics and tagged Brett Kavanaugh, Elizabeth Warren, Kirsten Gillibrand, Linda Sarsour, Women's March. Bookmark the permalink.